With the Undying Festival coming back next week, if you complete all the clues and get yourself a limited edition Daisy pet, it can now wear these costumes!! Today's random theme is Hidden Avatars!!! Here are 74 new minipet themed Hidden Avatars for you to find! There are also 12 new Musical Instrument themed Hidden Avatars to find!! Its been a while since our annual Undying Festival has run, but we are happy to announce that its back and will be starting one day next week! For those who have never been here for this summer festival, it has nothing to do with Halloween. Instead, there are lots of clues for you to follow, each with a letter and a prize once solved. When you reach the last level, you then have to use the letters you collected to solve the puzzle and you will get a limited edition Daisy pet and a hidden avatar that will retire, plus this year 150,000MP! Make sure you are all playing next week!!! The Pet Trades and the Pet Exchange fees now include gourmet food and elite gym stats. There are 45 new Hidden Avatars for you to find. The Lottery has been drawn for this week. comanches_girl is the winner of the 516,100MP Jackpot with the winning numbers of 20, 9, 13, 3, 12 and 22! Congratulations! Last Week's Raffle has now ended. zeppelinfan45 is the winner of the Red DNA and 100,000MP prize with the winning raffle ticket number 752! Congratulations! Make sure you buy your tickets for today's raffle - only 10MP per ticket! Here are 6 new Hidden Avatars for you to find! All Easter Eggs from random events and the Pot of Gold have now retired. The Dukka Piracy shop will no longer add any new items, but will close and retire when the majority of players have spent most of their Dukka Points! We have a new Vampire themed Character Account Upgrade. 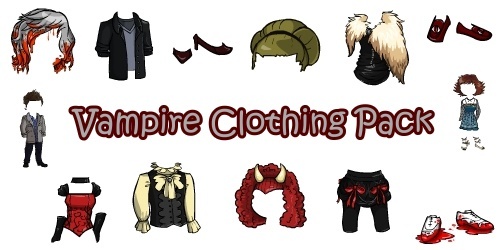 This Account Upgrade has a total of 14 items with 3 wigs, 4 shoes, 2 character costumes and 5 clothing items. These three new Minipet Coloured pets were just found swimming around the shores of Minipet Island. Sooooo cute!!! A new Editorial has just been released. All questions have been reset, so now is your chance to send in your questions, ideas, comments and suggestions to help improve Marapets! There are 5 new Giftboxes on sale in the Account Upgrades page. You can use the Double Crystals Giftbox to earn double crystals for life when you complete an Elger quest, the Double Diamonds Giftbox to earn double diamonds for life when you complete a Knutt Knight quest and the Simerian Statue, Trash Heap and News Stand Giftboxes mean these you use these features twice as often for life!! There are 11 new Hidden Avatars and the Hump Default Avatar has been released. The News Stand has just opened in the City of Marada. The news agent at the city news stand sells newspapers. You can buy a newspaper for 250BP once every 2 hours and he will give you a random newspaper from one of the worlds in Marada. 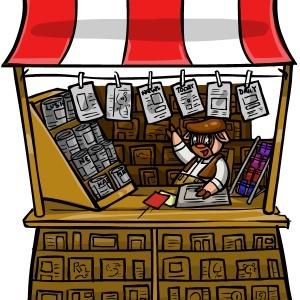 Every month, the newspapers he has on sale are updated with the latest news, and any newspapers you bought here from the month before are retired and no longer on sale. You can read newspapers to your pet, just like a book. A new Webcam has opened in Ziranek. Every member has their own photo album to show off photos of their pets. The webcam will allow you to take a cheap photo prints once every 12 hours for a small fee of 2,500MP. Select the pet that you own and if the photo is currently avaliable you will have the photo taken and added to your inventory, where you can trade it or add it to your photo album. You can now collect your Photos quicker than before! Use the new Webcam Giftbox and you can use the webcam to take photos once every 6 hours, instead of every 12 hours. The DVD Shop has 40 new dvd items restocking. 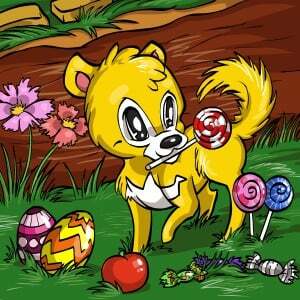 The Candyland Goals now have 20 new levels! The Lottery has been drawn for this week. andaralinco is the winner of the 416,500MP Jackpot with the winning numbers of 6, 12, 14, 9, 3 and 5! Congratulations! Last Week's Raffle has now ended. kikisee is the winner of the Red DNA and 100,000MP prize with the winning raffle ticket number 3406! Congratulations! Make sure you buy your tickets for today's raffle - only 10MP per ticket! The Game of the Week has now changed to 3some. There are 17 new Hidden Avatars for you to find! There are two new Undying Minipets. This means that the Grave Robbing feature now has 100 new Bones avaliable for you to dig up. A new Minipet themed account upgrade has just been released. 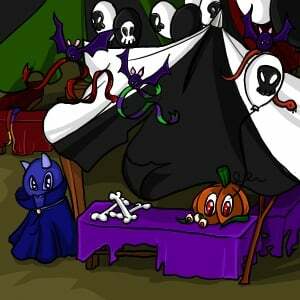 You will receive a minipet/mini themed cd, book, dvd, pearl, costume, stamp, minipet and either a Minipet Dakota Potion or a Minipet Fasoro Potion. There is a 1 in 3 chance of you getting a Dakota instead of a Fasoro. It is entirely random and you do not know which you will receive. There are 63 new Photos for you to collect. The Gigantic Paradise Goals now has 15 new levels! 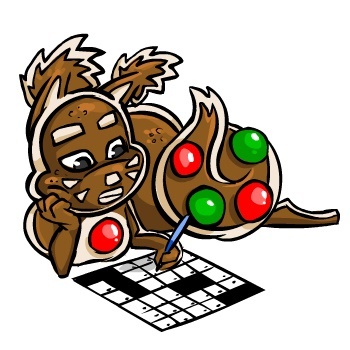 A new Crossword game has just opened in Candyland! There are two new Candyland Crosswords every month. A new crossword is released on the 1st and the 15th of every month. You will receive 15,000MP for successfully completing a crossword game, and if you are lucky, you may also win a Bonus Item Prize! IMPORTANT - you are allowed to discuss the answers on the Forums, but it is against the rules to post the answers or list any answers to the Crosswords on forums. You can maramail answers, list them on your blog or marasite, but it is against the rules to ruin the game on the forums for those who do not want the answers! Marapets now has its own Facebook Page. Most of the world now has a facebook account and we thought it was about time we had one. You can join/like our Marapets page at any time from the like button below the site search/logout on every page of Marapets. We will be using our Facebook Page to bring you some random secrets, unreleased news and the ocasional free vault code! Please remember though, you have to be 13 or over to join Facebook and you are not allowed to post any personal information about yourself, including your real name, anywhere on Marapets! We have just released a new Goals Game. At every level you have a new goal to complete related to Candyland. 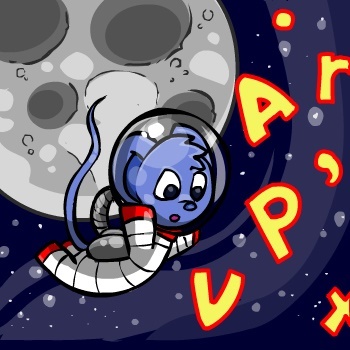 Each level gets harder to complete but you will receive a prize for completing each level. Unlike quest and mission games, you have unlimited amount of time to complete each goal level and you can only complete them once. New levels will always be added to the Goals in each world. Prizes include rare items only avaliable from goals, MP, BP, RP, Dukka Coins, Account Upgrade Credit and stats for your pets. The Candyland Castle Goals is the 13th world to have goals and currently has 12 levels for you to complete. New levels will be added in the news to these goals all of the time, each with a brand new prize. The Candyland Goals have been added to the Candyland map. When you complete a level of the Candyland Goals, you will receive a cool shield on your profile, showing everyone what level you have completed in the goals! 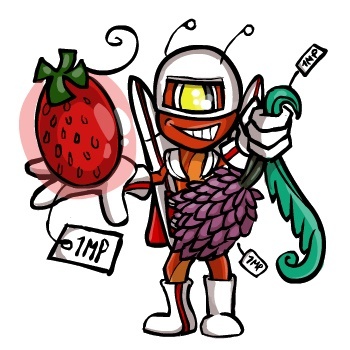 1MP Auctions has just been released in Planet Enpiah. The Enpiah Alien puts up a new item for auction every 10 minutes. He randomly selects any item on the site and no matter what rarity or value, he lists the item for 1MP. If you are really lucky, you may catch a very rare or retired item. The Word Search is back! It is a new weekly game in Enpiah. Every Wednesday a new word search is released. You need to find and enter as many of the words you can in the box below, each seperate by a comma. Each word search has a theme and the words are always Marapets related! The more words you find, the bigger the prize you will receive! You may also get lucky and win a Bonus Item Prize!